I am thrilled to announce my latest review and giveaway partnership, this time with another terrific diaper vendor and manufacturer from right here in my hometown. For me, there is nothing better than finding a local product that I can ensure is made with quality, according to Canadian standards. Having an item manufactured right here on Canadian soil also ensures that the workers are paid a quality, regulated wage, and provided with the same government-regulated holidays, benefits, and rights that the rest of us enjoy as citizens. I don't know about you, but although I do still buy my fair share of products from overseas, I am always a little leery about what might be happening in regards to workplace conditions or workers' rights. 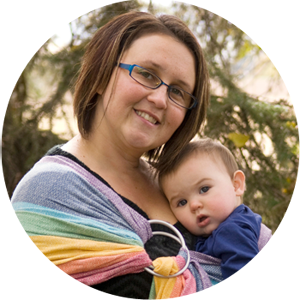 So, in that regard alone, you can feel great about purchasing from Edmonton's Driline Baby. Driline Baby is a subdivision of other local company, Dri-Line Products, Ltd, which supplies a variety of incontinence and other supplies to everyone from regional parents to hospitals to homecare services. I worked in direct contact with Yasmin, the owner of the business, and had a terrific experience dealing with her. Her customer service was amazing, and she replied very quickly to emails. By working with her, you can tell that she really has a passion for helping peoples' families and helping out the environment by spreading the good word about cloth diapering! It's great to see business owners who are still so passionate about what they do, even after many years in the business. Yasmin gave me an extremely generous stash of goodies to review for you. So, please read through the entire run-down, because I guarantee that Driline Baby will have something for everybody. Cruise over to their website to see their terrific selection of prefolds, fitteds, covers, all-in-ones, accessories, and even mama cloth! The first two items that I tried out with baby Aurelia are a very popular item that Yasmin is working on possibly expanding on. 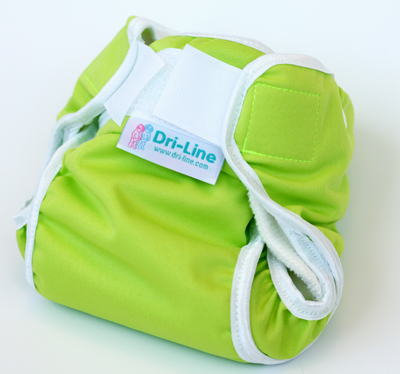 I tried out the Driline Baby Dri-Wrap (diaper cover) in two different sizes and colors (small & medium; lime & aqua). These covers are so cute, and I loved the vibrant colors! 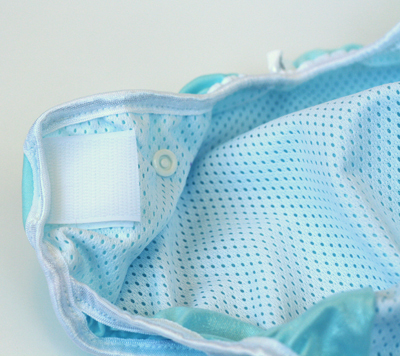 The inside is lined with a mesh layer to help improve the air-flow between the diaper/liner and PUL cover. These covers are also hook & loop closure, which at first I was not thrilled about. In the past, I have used hook & loop diaper covers, and they have always either rubbed up against Baby's skin and scratched it, or started to curl, or come undone in the laundry and stuck to everything else, or got coated with fuzz in the laundry because the laundry tabs didn't work well. I am thrilled to report, though, that I can say, without a shadow of a doubt, that Driline Baby products have THE BEST hook & loop closures of anything I've ever used (baby clothes or otherwise!). Honestly, this velcro seems to be army strength or something! The tabs are nothing fancy, but I think that is part of the reason why they stick so well (to the main waist closure and to the laundry tabs). 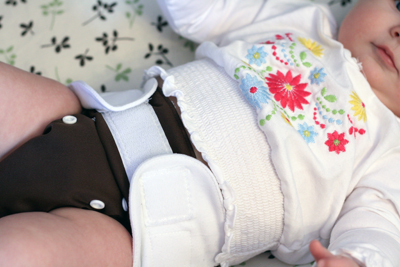 The convenience of hook & loop is really nice, and are easily just as convenient to put on baby as a disposable diaper. Yasmin is also currently working on a revamp of this shell to include a snap-in liner to make this an all-in-two diaper system. She sent me a few to privately report back to her on, and I'm excited to see where they decide to go with this concept, as it is a very convenient, trim, easy-to-launder system that they are dreaming up! Very exciting! 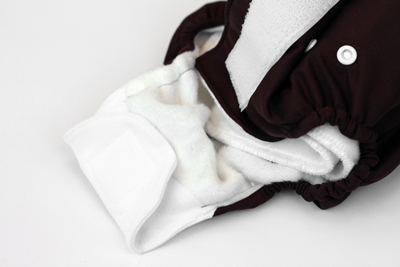 The Dri-Wraps have mesh lining, excellent laundry tabs & fit nice and trim! 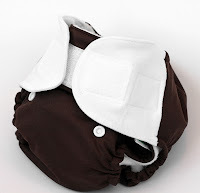 Another product that Yasmin wanted me to review were the Bamboo Baby All-in-One diapers. Now, I have never tried an AIO diaper, nor have I ever tried an all bamboo diaper (though I've tried one with a bamboo liner before, in the Blueberry Minky I just reviewed). Again, Yasmin sent me more than one style and color to sample. She sent me a lilac snap-closure, a chocolate hook & loop closure, and a blue hook & loop closure. 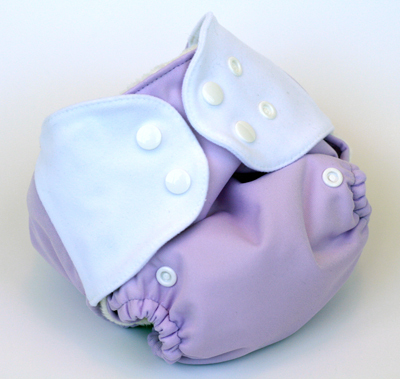 Again, these are very cute colors, and each diaper has the fastening tabs standing out in a bold white. It creates a nice two-tone effect. These are all one-size diapers with the ability to snap to a small, medium, or large rise. They have elastic in the back of the waist to give the waist tabs a great amount of stretch and flexibility when fastening at the tummy. I thought I would be a huge fan of the snap closure diaper better, but honestly, once again I am shocked by just how well these hook & loop closures functioned! Though a different design than the Dri-Wrap closures, once again this aplex worked better than any other I've ever tried. As a result, I was extremely impressed and ended up having no preference between the snap and H&L closure, which really surprised me. This diaper fit great in all three versions/colors! I tried this diaper out in various situations: at home playing, out in the car seat for a drive, as well as for a long nap and nursing session. I never had a single leak with this diaper--which can attest to just how absorbant the bamboo material really is. I love that this diaper is more eco-friendly than some, and that the natural fibers really do perform in terms of absorbancy. My one complaint isn't with the diaper but--again (just like with the Blueberry Bamboo diaper I tried)--is with the bamboo itself. 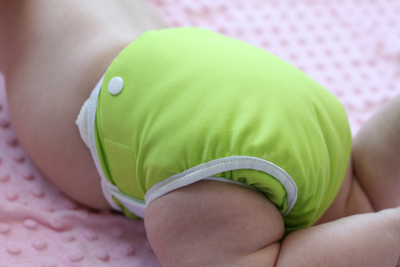 Although the bamboo seems to absorb and absorb to no end, it really does not wick away moisture to anyplace within the diaper, so all that moisture just sits there against baby's skin. I did prewash these diapers three times before I used them (to "prep" them and remove any lingering natural oils), but repelling was not the problem; wicking was. In the end, I began using some inexpensive, thin microfleece liners in between the bamboo layer and Baby's skin, and that ended up working fabulously. Overall, this is a cheap solution to creating a "stay dry" layer, and it still gives you all the other benefits of using bamboo. The other thing I ought to mention is that laundering bamboo had me go through a bit of a learning curve. Normally I hang all my diaper covers and shells to dry (on a bar in my laundry room closet) and only toss the inserts and wipes in the dryer. However, I found that solely line-drying the bamboo does not have pleasant results. After much Googling and message board lurking, I found another user's description to be the most accurate: "the bamboo, after being line-dried, feels like a dingy, crispy old towel". That's true. After much trial and error, I found it most helpful to toss the bamboo diapers in the dryer (with wool dryer balls) for about 15-20 minutes and then remove them to finish hang drying. This restored much of their softness. The final item that Yasmin included for me to try is a very well-designed diaper changing pad. Now, I have a change pad that came with the diaper bag I got, and the edges of it are are already shredded and unraveling. Getting a new changing pad right now was perfect timing, and I have to say, this one has a much superior design! 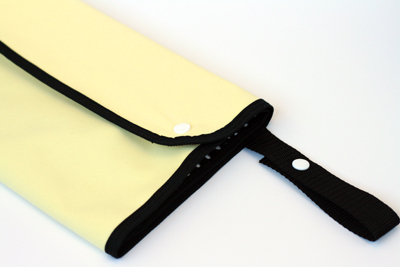 This change pad fastens with snaps and has a small strap for carrying or fastening it onto a bag or handle, if need be. I found it much larger than the other change pad I've been using up until now, which is terrific as there's nothing worse than having too little surface area when changing your baby on a grubby public change station! When I'm using a public change table, I want maximum coverage so Baby doesn't touch whatever germs might be leftover from the last patron! My favorite feature of this change pad is something I've never seen before--each side has two flip-out mesh flaps that are great for tucking in any other items you might need. You could tuck in some cloth wipes or cotton pads for diaper cleanup, for example, or even a flat tube or rash ointment or an extra prefold, cover, or liner, if you wanted. I loved this design so much, and it really is something unique that I've never seen before! I look forward to using this feature as I'm also beginning the transition from disposable to cloth wipes! Overall, I was very impressed with all that Driline Baby had to offer. They have an amazing selection of products, all made from my own neck of the woods! I really hope you stop by and pay their their website a visit! Plus, one of our readers is going to be lucky enough to win an amazing prize pack from Yasmin as well! 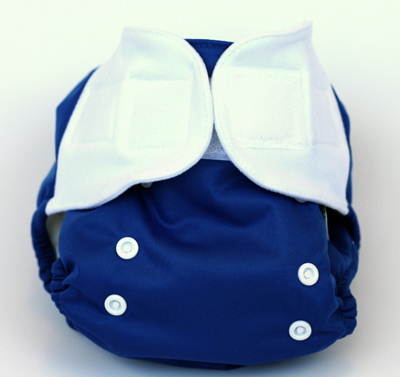 Head over to Driline Baby to purchase a new diaper or accessory! Check their site for a list of online or local retailers! Driline Baby is generously offering one lucky reader a terrific prize pack featuring: a Bamboo Baby AIO diaper, a crib pad, and a plush hooded baby towel! Please read all the Giveaway Policies and Rules before participating. 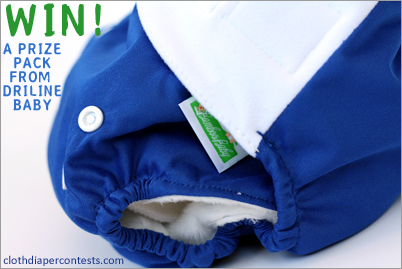 Follow the Cloth Diaper Contests & Giveaways blog with Google Friend Connect. Leave a comment stating you have done so (include your GFC name if needed). Final details: I received no financial compensation for this review or giveaway, though I did receive the sample items free of charge. All opinions shared are my own, and I was not persuaded to share anything other than my own thoughts. This giveaway will end on March 7, 2011 at 11:59pm MST and is open to residents of Canada and the United States only. Winner will be chosen randomly using random.org’s services. The winner will be contacted by email and will have 48 hours to reply before a new winner is chosen. The prize will be supplied and mailed out to the winner by the sponsor of this giveaway. I'd like to try the Driline SnaptoFit cover. Another Driline product I am interested in are the Wipes, these look very sturdy. GFC Follower of Everything Cloth Blog @Alisha L.
I follow on GFC. Also a member of the forum (mictherr). 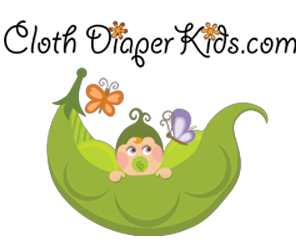 I LIKE Cloth diaper contest and giveaways on facebook. I like CDC&G on Facebook as Andrea Grupe. I posted it on Facebook as Andrea Grupe. I follow Everything Cloth using GFC. I signed up and left a message at the Everything Cloth forums. I think that's a great project! My username is Andrea G.
I subscribe to email updates from CDC&G. I'd like to try the snap to fit cover in orange. I would like to try their no-folds. I like the Snap to Fit Cover in lime green! I follow Everything Cloth on GFC! I have the AIO and love it! I would also like to try the changing pad. I visited the driline baby website, and I'd like to try the pumpkin patch diaper. I 'Like' CD contests and giveaways on FB. I 'Like' Everything Cloth on FB. I follow Everything Cloth via GFC (magnus_pegasus). I follow @drilinebaby on Twitter. I follow @EverythingCloth on Twitter. I voted for your blog in Picket Fence Blogs. 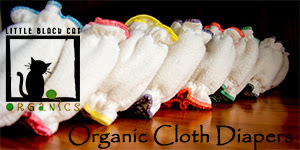 I blogged about this giveaway: http://thesahmlife818.blogspot.com/2011/02/cloth-diaper-giveaway.html . I'd like to try the Form Fitted diaper! i'd try the pumpkin patch diaper! i like everything cloth on fb! I really want to try the snap to fit cover! I follow CD contests on twitter! I follow Driline on twitter! I follow Everything Cloth on twitter! i love to get one of their recieving blankets. they look awesome for my baby! I get your blog emails! I'd love to try the Snap to Fit cover (love those leg gussets).